Apple's dramatic price increase for its top-of-the-line MacBook Pro notebooks was aligned with the company's recent contention that the iPad Pro, when equipped with a keyboard, was a suitable substitute for a personal computer, analysts argued today. "Normally they keep the price the same, but it's not just a refresh. 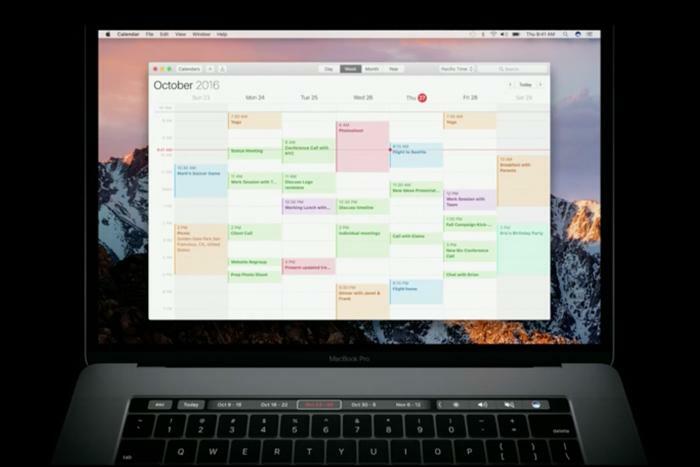 They're trying to find a different place in the market for the MacBook Pro," said Carolina Milanesi of Creative Strategies. That "different place," Milanesi continued, was at an even higher price point to portray the system as an even more premium personal computer than the MacBook Pro was before the hike. Why? Simple, said Milanesi. Apple has made the case that the iPad Pro, whether the 9.7-in. tablet or its larger 12.9-in. sibling, is a more-than-adequate replacement for a personal computer for some buyers. Apple has been touting the iPad Pro "as people's next PC," said Milanesi. "You have to have a continuation of price points," she added. 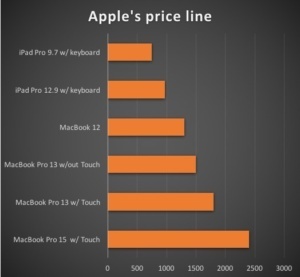 And the new prices of the MacBook Pro are at the far right of what she called "one big line" of price points. The MacBook Pro increases were both large and unlike Apple, which historically has kept prices stable when revamping models, and sometimes -- most recently in early 2013 -- lowered prices during tough times. Apple did the opposite yesterday. In the face of a four-quarter Mac sales downturn, the Cupertino, Calif. company priced the 13-in. MacBook Pro with the Touch Bar at $1,799, a $500 jump and a 39% increase over the same-sized predecessor. The larger 15-in. MacBook Pro with the Touch Bar was priced starting at $2,399, $400 (and 20%) higher than its forerunner. Those prices, as increases, would be unprecedented for Apple. But Milanesi argued that they should be seen not as increases in existing products -- notebook name plates notwithstanding -- but as initial prices for a new product. "Apple is repositioning the product, reinventing the [MacBook Pro]," Milanesi said. By pushing up prices for the MacBook Pro -- as well as dumping the $899 11-in. MacBook Air and the aged $1,099 non-Retina 13-in. MacBook Pro -- Apple created more space at the lower range, opened up the middle segment of the line and debuted a more expensive, and likely more margin-friendly, top end. "When you put the new MacBooks, older MacBooks, and iPad Pros together, you get an interesting picture in terms of price and performance coverage," said Jan Dawson, chief analyst at Jackdaw Research, in an analysis posted to his blog. Specifically, deleting the 11-in. MacBook Air raised the difference between the top iPad Pro and the lowest-priced clamshell laptop from $100 to $200. Apple's least-expensive traditional-style notebook is now the $999 13-in. MacBook Air. The change emphasizes the lower cost of the iPad Pro, even with a Smart Keyboard. Want a computer from Apple? Then $999 is the entry point for something traditional. But below that are the tablets, keyboard-equipped or not, that Apple's argued are the PC for most consumers. "iPad Pro is ... the ultimate replacement device for customers switching from PC notebooks," Apple CEO Tim Cook asserted in July. Apple's advertising also picked up the message, labeling the tablet a "computer" when paired with a keyboard. Most importantly for its bottom line, Apple pushed the price line further to the right. Where base price once maxed out at $1,999, now it's $2,399. Others had different explanations for the price hikes. "Apple is relying more and more on enterprise purchases," said Ross Rubin, principal analyst at Reticule Research. "They're clearly making a bigger push there, where there's room at higher margins." "There's no denying that these products are premium, but they extend down into price points that many people will be able to reach, while providing really top-notch products for those that can afford or justify them," added Dawson, talking of Apple's portable line. "If you focus on those newer devices, I think this is the most coherent and logical MacBook portfolio Apple has had for years."